Anne Winter was co-owner of Recycled Sounds record store for 18 years. 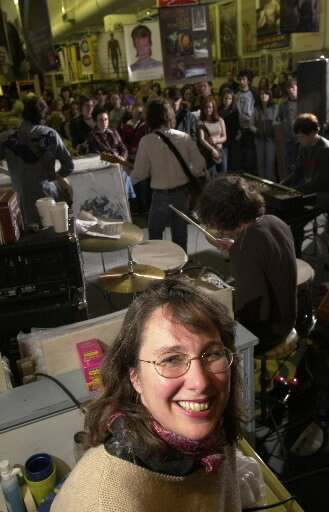 She donated a wealth of local music history to the Marr Sound Archives shortly before her passing in 2009. Photo Courtesy The Kansas City Star. The Marr Sound Archives received a number of local rock and roll releases from the late 1980s to the early 2000s from Anne Winter, shortly before her passing in 2009. The collection is a modest one, but the nostalgia factor is soaring as it shines a spotlight on the time period in which I was just getting into music as a teenager, when I used to browse the aisles of Anne’s record store, Recycled Sounds at 3941 Main Street in Kansas City, MO. – In 1989, Shrinking Violet Records put out a box set entitled A Limited Gourmet Box Set of the Unclean & Imperfect, which contained wax by Kill Whitey, The Sin City Disciples, Magic Nose, and Mudhead. The first 50 copies (we have number 216/500) were made with glow in the dark ink and each disc contains a photocopied insert. The artwork and subject matter range from unclean to imperfect, as advertised. The box itself came with its fair share of wear and tear, likely due to the amount of local music history crammed into such a small container. – Folk musician Danny Cooke released “What Goes Up Must Come Down” b/w “Inside Another Time” in 1991 on Nep Tune Records. His Brian Wilson meets Daniel Johnston songwriting and performance style is an acquired taste for some and outsider artist gold for the rest of us. After hours of casual research, I have found very little information on Nep Tune Records aside from two releases by Brent Wiebold, to whom Cooke gives special thanks on his record. Honorable mentions from this collection include 7 inch records regional acts on independent labels: Split Lip Rayfield, Rex Hobart and the Misery Boys, Uncle Tupelo, Grither, Season to Risk, Cher (U.K.), The Sin City Disciples, Tenderloin, Cretin 66 and The Get Up Kids, among others. A handful of LPs were also donated by Anne Winter. They are now cataloged and can be found in the MERLIN database. A spreadsheet listing all of her donated 45 RPM titles is available upon request, and, of course, donations of local and regional vinyl releases are always welcome at the archives. This entry was posted in Music, Staff Picks and tagged 45 RPM Records, 7 inches, Anne Winter, Danny Cooke, Kansas City, local music, Mudhead, Nep Tune Records, Private Press, Recycled Sounds, secret stash, Shrinking Violet Records, Sin City Disciples, vinyl by Andrew Hansbrough. Bookmark the permalink. Senior Library Information Specialist with the Marr Sound Archives. Thank you for archiving Anne’s music history collection and for highlighting the local musicians she loved. This post is a wonderful tribute! That’s fantastic. Anne was always such a champion of Kansas City and regional bands, and Recycled Sounds is a major part of Kansas City music history… My very first band was created by Anne and Kurt, when they asked me to play their wedding, and they introduced me to a couple other musicians… Our first band practice was on the sidewalk outside the store. Thank you for carrying on the legacy. I was always in awe of my sister. She was amazing. She had this incredible ability to organize anything from a ping pong tournament to a major Culture Under Fire event. She cared so much about others. She inspired everybody she met. Thank you for writing this. Some of my most vivid memories of my cousin Anne were at her wedding and the few times we visited her record store. I remember she took time out of her reception to sneak some of us kids in a back room to show us to a box of kittens that were born just weeks earlier. It was so rustic and elegant all at the same time. And the excitement she had to unlock the doors after hours at Recycled Records to let us roam around the crates fullll of records. It was were my first musical mystery tour began. She threw a record on and blasted it. I could feel the energy seething from the speakers. And from that day forward She was my favorite cousin!